Barbara Pachter's Blog: Pachter's Pointers: Don’t Whine About Your Job. Do Something! Don’t Whine About Your Job. Do Something! My coworker hates her job. She keeps complaining to me. I have tried to talk to her about what she could do, but she is not listening. My husband keeps threatening to quit his job. He only comments negatively about his job and the people who work with him. I wish he would just do something. My friend was having difficulty with her schedule, but she didn’t go to her boss to discuss alternatives. She just quit. When I had a problem, my boss adjusted my schedule. My friend’s might have been adjusted, too, if she had said something. As these comments from participants in my seminars indicate, tackling problems that affect our work lives can be difficult. When some people become dissatisfied with their work, they do nothing. Perhaps they don’t know how to proceed, or maybe they don’t believe there is anything they can do to improve the situation. Usually, the only action they take is to whine about their bosses, their colleagues, or the work. Unfortunately, complaining doesn’t accomplish anything – except having your friends, colleagues and others stay clear of you. Some, on the other hand, get so frustrated that they impulsively quit their jobs without having another lined up, or without even a plan for the future. Both reactions can affect your career negatively. However, there is an alternative that can help people evaluate their work situations. Answering the following four questions encourages people to take action and decide their next steps. 1. Ask yourself, what is the real issue? It is easy to say, “I hate my job,” but it is important to identify why. What is the real issue that is causing you to be unhappy? Be honest and be specific. Is it the type of work you do, or just one aspect of the job? Is it the commute, the money, your boss, the people you work with, or any number of other causes? One man I coached liked most of the facets of his job, but wanted to quit because he had to make frequent presentations. Another realized that her new position involved using unfamiliar technology, which made her feel uncomfortable and unqualified. 2. Can you solve the problem? Now that you have identified the issue, is there something that can be done? Is there a realistic solution? If so, what do you have to lose by asking for it? Make the case for your suggestion, including any benefits to your department or to the company. One woman realized that she liked her job, but it was the commute that was driving her crazy. She asked her boss if she could work from home two days a week. Once she assured her boss that her productivity wouldn’t be affected, she was successful in having her schedule changed. Remember that if you don’t speak up, chances are nothing will change. --Is the job a stepping stone? Will you need the skills you gain from this position to qualify for a job on the next rung of the ladder? One of my early jobs involved working for a horrible boss. Yet I stayed until I had gained the experience I needed, and then I left. --Is there any education or training perk to which you have access? Some companies will fund part or all of your ongoing education. This can be a major benefit for many people. --Who are you meeting? Does the job allow you to interact with people and build your network? If so, it is possible that by having a strong network, additional job opportunities will come your way. 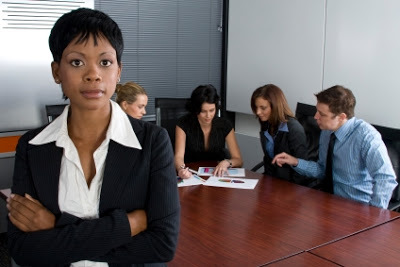 --Can you learn to manage your boss? Learning to work with difficult people is an important skill that almost certainly will be beneficial to you at some point in your career. 4. Is it time to start a job search? Depending on how you answer the above questions, you may decide that it is time to start looking for a new position. You may even decide to change careers. Any number of alternatives may now be available to you. This doesn’t mean you just quit your job. Generally, it is best to look for a new job (or career) while you are still working at the old one. Information on conducting a job search can be found in my book The Essentials of Business Etiquette: How to Greet, Eat, and Tweet Your Way to Success. Whether you decide to stay at your current job or to look for a new one, feel good about your choice. You are doing something: You have taken charge of your career. Pachter & Associates provides seminars and coaching on career development, business presentations, professional presence, etiquette and communication. For additional information, please contact Joyce Hoff at joyce@pachter.com or 856.751.6141. This is such a great blog. you really covered it all. Thank you for sharing such an important information. Hope to get some more information in future also. Love Vashikaran Specialist in India. 100% satisfaction guarantee Call @ +91-9815872813. I admire this article for the well-researched content and excellent wording. I got so involved in this material that I couldn’t stop reading. I am impressed with your work and skill. Another great information,i like this kind of blog information really very nice and more new skills to develop after reading that post. If you have libraries at home you can write well. You can also see pa school essay examples for better writing results. This is Murali Cherat, Having 30 years of joint experience as Independent director, Interim CEO, Turnaround specialist, Subject matter expert and Business consultant. It was a good article. It is more costing article. It is too informative and helpful. Amazing educational idea i like his tips thanks for share it business personal statement . Nice post, Thanks for sharing this valuable information with us. Best Services and Nice Blog Thanks. Very Impressive Article . I like your Writing Skills Very Clear to the Point and Informative. Looking for ward to see more update like that.